This is so easy you'll be surprised I bothered with a tutorial! First I inked the baby wipe with reinkers (Pear Pizzazz, Not Quite Navy and Baja Breeze in this example). Next, I inked a clear block (as one does when clear block stamping), and after insuring it was inked well all over, stamped it onto Very Vanilla cardstock. The wetness of the baby wipes gives it a much more mottled/tortoise shell type look than one gets with a regular ink pad. Then, I let it dry for about 15 minutes. Next, I used the Big Shot and the Butterfly Bigz Die to die cut the butterfly. 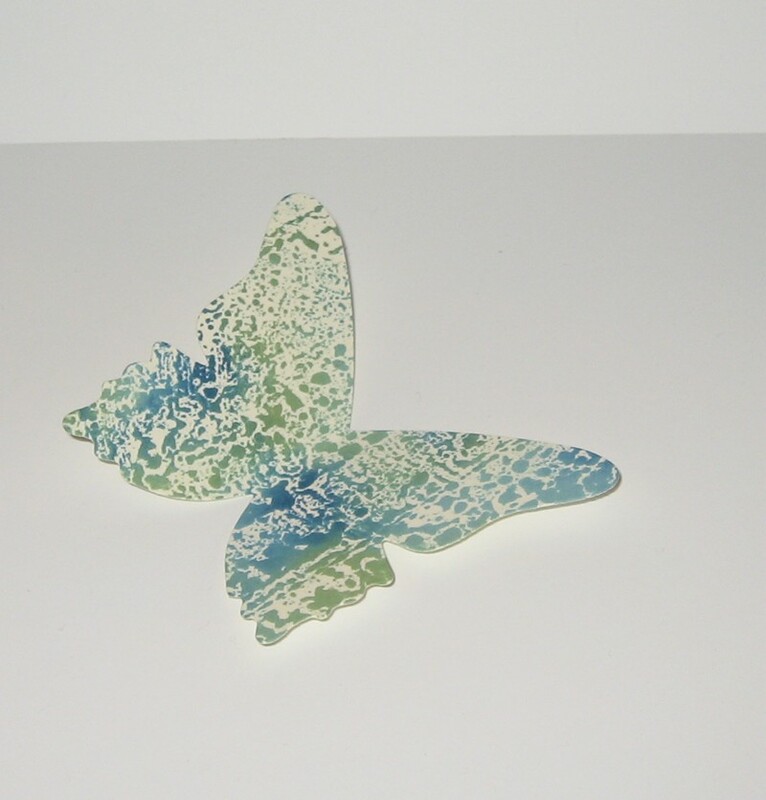 On this card, I sprayed the butterfly with a mist of alchohol and shimmer paint for a little glimmer as well. 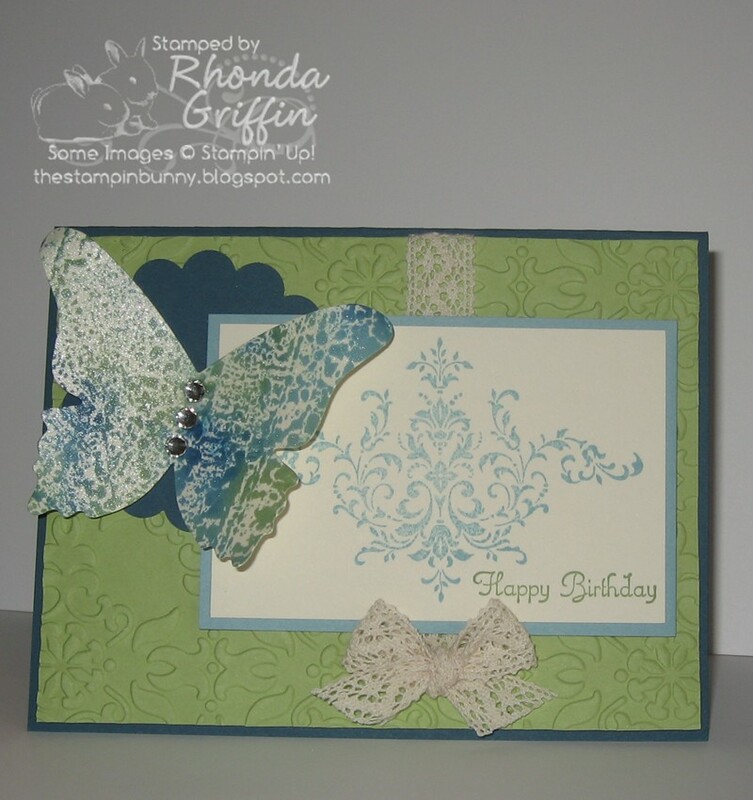 Welcome Stamping Friends to the Stampin' Addicts Birthday Techniques Blog Hop! Our Birthday Hop this year features birthday cards again, but this time with a variety of fun techniques for you to enjoy. You may have arrived from Jennifer's Blog, Stampin' On the Fly, where you enjoyed the Clear Block Stamping technique on her lovely projects. Should you get lost or want to chat about the blog hop, visit the Blog Hop Chat Thread on Stampin' Addicts for a list of all the participating blogs in order. 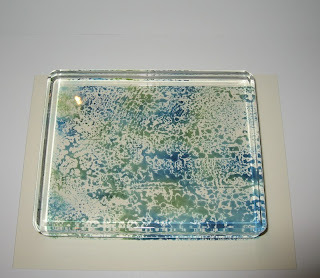 I'm featuring the Baby Wipe Inkpad Technique in which you put several colors of reinker onto baby wipes to create a multicolored "inkpad" to use for stamping solid image stamps. This card probably doesn't look like a Baby Wipe Inkpad card.....Perhaps a marker to stamp or Poppin' Pastels? 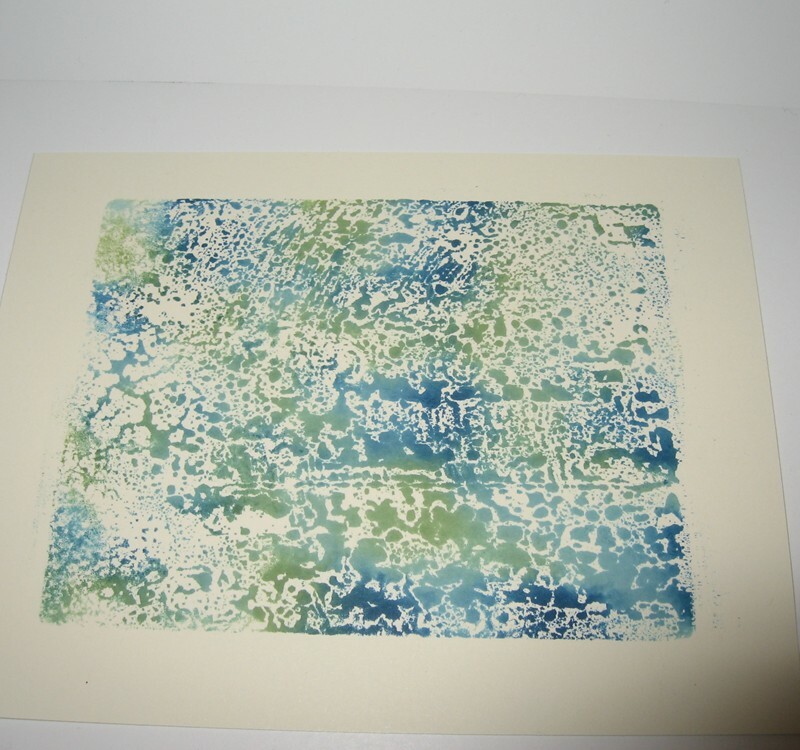 I added Perfect Plum, Pretty in Pink, Bashful Blue, River Rock and Old Olive to certain areas of the Baby Wipe Inkpad to create this image and give it a watery look. A little old school sponging and a few of the great SU! colored brads in Soft Suede and Perfect Plum keep the ribbon from being the focal point of the card and allow your eye to take in the main image. Check back for a mini-tutorial on this idea on Wednesday. For this card I used a clear block to stamp onto a Pear Pizzazz, Not Quite Navy and Baja Breeze Baby Wipe Inkpad which created almost a tortoise shell or crackle look. I spritzed it with an alcohol mist made with Stampin' Up! 's Frosted White Shimmer Paint after cutting out the butterfly shape using the Big Shot. I curled the wings a bit for interest. This card features Mojo Monday Sketch #178 (MOJO178). The Happy Birthday image from the Create a Cupcake Set has a whimsical yet elegant look that I think matches the mood of this card, but it is so versatile that it really goes with anything. 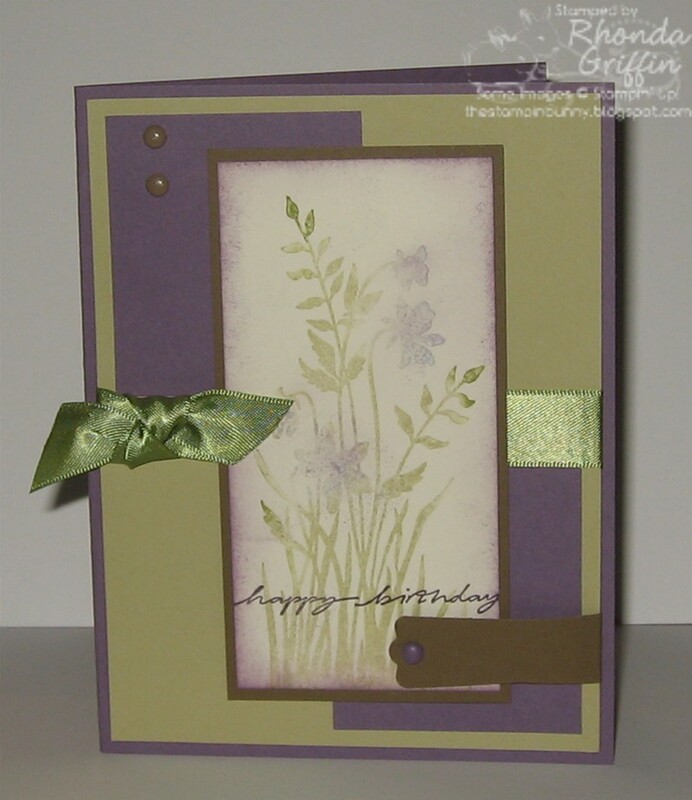 Check back for a mini-tutorial with pictures of the process of making this card on Monday. So Saffron, Pretty in Pink and Melon Mambo for a tropical hibiscus on this birthday card. 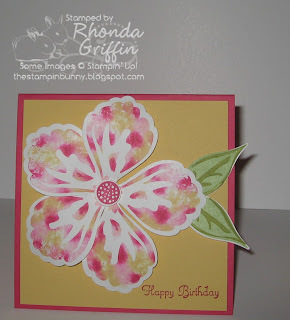 I had a happy accident when I stamped the petals for this card. I caught a spot in the middle of the stamp with ink (due to the thickness of the baby wipes) and stamped it onto my card as well. I think the added color in the middle of an open space that would have been white on my example worked out perfectly! The leaves on this card would still fit in a regular medium SU! envelope because it is a 4-1/2 X 4-1/2 inch card. Now click on over to Tanya's Tinkerin' In Ink blog for a look at her fun Reverse Faux Letterpress creations! I hope you enjoy the hop! 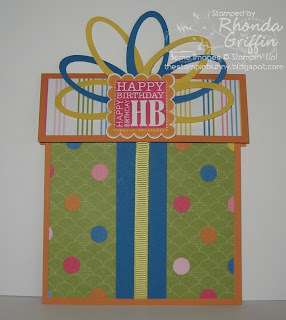 Happy Birthday Stampin' Addicts! Today's post is for the Stampin' Addicts Fun Fold Tech #5 today on Stampin' Addicts! It is a great birthday celebration this week with a Technique focused birthday blog hop this Friday (check back to see it here of course! ), so look for fun things all around the Stampin' Addicts site and join in! For today's Fun Fold, Vicki Burdick has graciously allowed me to feature her Wrapped Present Gift Card Holder. 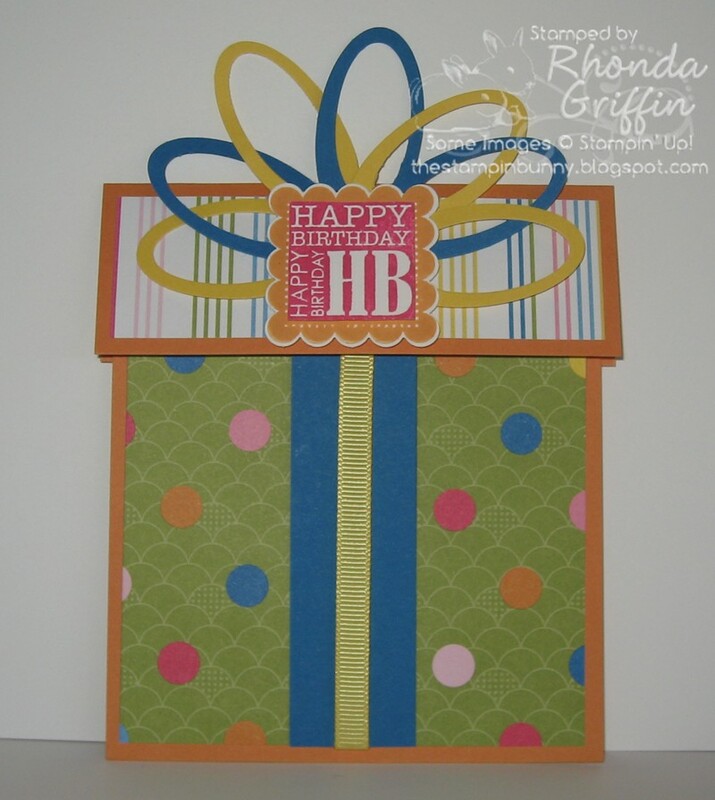 It is the perfect festive Birthday gift card holder and is great for celebrating for us on Stampin' Addicts! Thanks Vicki! 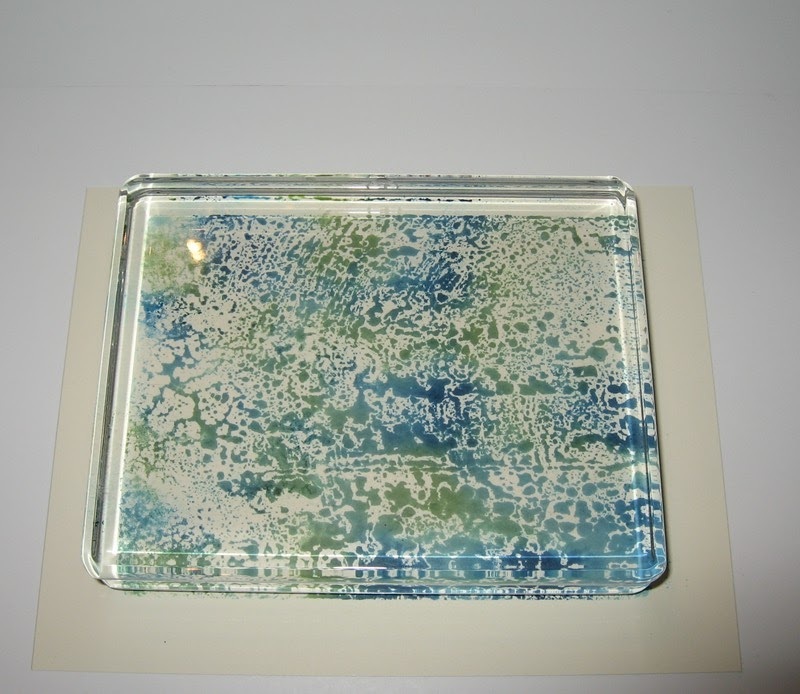 Here is a link to Vicki's blog for a peek at her instructions in case you could use a second explanation: It's a Stamp Thing: Gift Card Holder It does not fit in an envelope, but do you really need one? 1. Cut a piece of base cardstock 4" by 8", a piece of cardstock 4-1/4" by 3" (score in the the 3 inch side at 1-1/2"/down the vertical middle), and a piece of contrasting/matching cardstock at 1" by 4". 2. 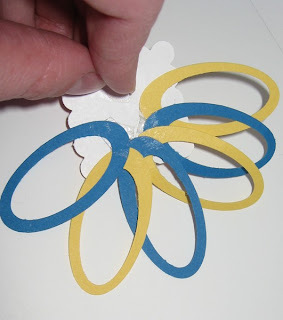 Cut designer series paper to match 3-3/4" by 3-3/4 " and just under 1-1/4" by 4". 3. Cut your bow by first punching the small oval punch and then punching the large oval punch around it. I tried for a consistent top and put the extra cardstock (since they do not layer perfectly) at the base to allow for gluing. I glued them with Mono Multi in the green and white bottle and sticky strip, but for class glue dots work well. 4. 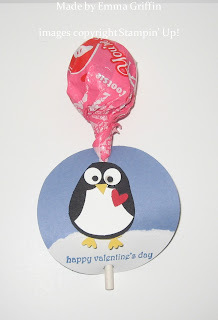 Use sticky strip to close the 8"X4" base and use a gift card to position a piece of sticky strip horizontally across the card so that the gift card or cardstock attached to it doesn't fall all the way to the bottom (for me it was 3/4 of an inch from the edge). 6. Fold your "lid" and adhere the dsp to the front. Make your embellishment for the front and put the "bow" behind it. 7. 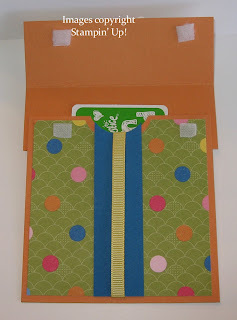 Attach velcro to the flap putting the "pokey" side on the card and the "fluffy" side on the flap for ease of use. If you have adhesive velcro, I wouldn't trust it--I used a dot of Mono Multi green top glue. 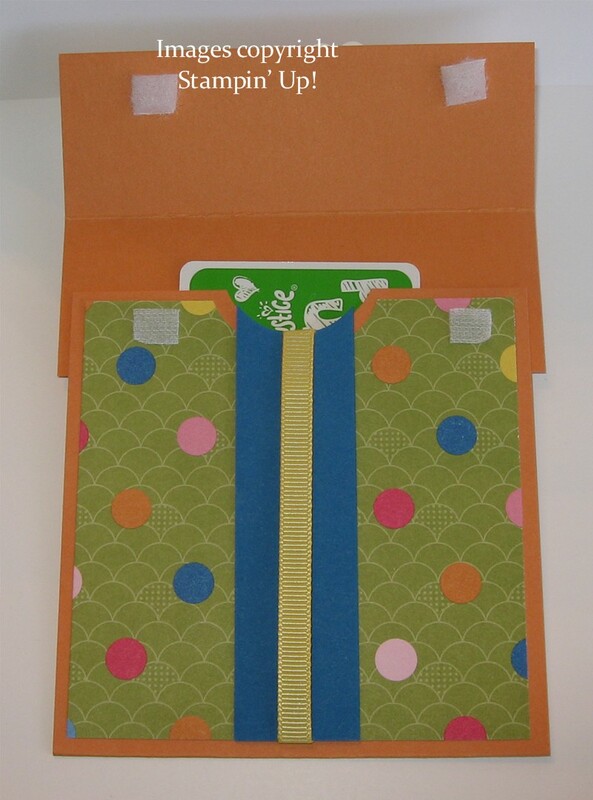 I enjoy the bright colors and fun accents of this Designer Series Paper and Quick Accent Set. They are great for scrapbooking, but also for making quick cards. For Quick Class this Thursday, my customers will be able to choose use the quick accents of their choice to make a card in record time. 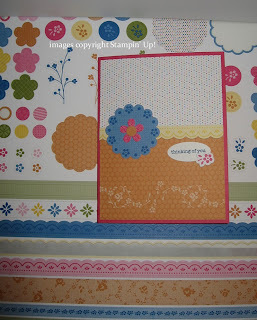 The new level one hostess set, A Slice of Life, in the Occasions mini catalog is quite a useful one! 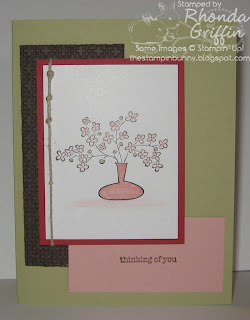 I enjoyed the baby onesie on a card a few weeks ago, and I enjoyed working with the dogwood blossoms today. I used the square lattice embossing folder to create a nice texture on the Early Espresso cardstock layer, and I think this card's color scheme contributes to the simple modern look too. When coloring the blossoms, I used the tiny end of the Blushing Bride marker to quickly make a loop of color so that there is still some white on the petals. I enjoy the knots in the hemp twine too. Today I thought I'd show you the Valentine lollipop decorations my daughter made for her classmates. The penguin was made using the Owl punch. I've not been able to determine the first creator of the penguin from owl punch, but it certainly wasn't me! We thought the round background and torn snowy edge looked nice too. Hope you have a great day!